During this meeting we discussed our regionals, the middle school regional volunteering opportunity and upcoming events. This Saturday is our Regional Competition. 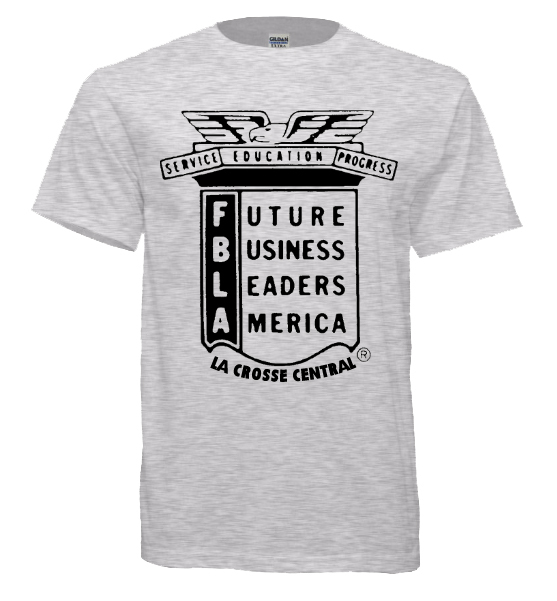 *Wear Your Gray Central FBLA T-Shirt This Friday Before Regionals! *BAAs Due on March 1st! During this meeting we discussed the Monday night meeting, volunteer work, the upcoming social event, RLC, the middle school FbLA and our holiday party. At this meeting we discussed the Business Achievement Awards and Competitive events. Mrs. Colburn gave out usernames and passwords for the FBLA BAA website to everyone who was present. Folders of information related to your competitive events was also given out. If you did not attend please see Mrs. Colburn. The date for the Escape room is Wednesday, December 28th around noon during winter break. We will be getting food together beforehand. There had been a sign up but if you would like to attend please contact Carissa. The cost for the escape rooms is between $20-15 and the chapter will cover half of you ticket. We will be booking a new date for the Salvation Army. Sign up next meeting. There will be a meeting on Friday, December 9th at 7:40 AM in room 115 to discuss agendas, rides and dates we could go. People who signed up will be emailed more information. ​For lunch, they will be serving sandwiches, chips, and cookies from Erbert’s & Gerbert’s. Vegetarian and gluten free options will be available; however, you must notify Mrs. Colburn by January 9 for those options. Our holiday party will be during MLT on December 22nd. Please bring treats/punch/etc. We will be making cards for Operation Gratitude. The next member meeting is on December 21st at 7:40 AM in room 115. During this meeting we discussed the NFLC, future social events, competitive events Monday night meetings, and community service projects. Everyone enjoyed it and would like to go again. We went on tours, attended many workshops and meet many new friends. We encourage everyone to attend next year's WFLC. We will be doing the 5k during the spring. We will be doing with will the local american legions and we are looking into sponsorships. We will make a committee for this in January if you are interested in helping out. We will be doing the Escape rooms as a chapter social sometime before or during Christmas break. We are thinking about doing some community service like salvation army, bell ringing, horse rescue or hunger task force. We don’t have any official dates yet. Middle School We will be going to Longfellow to help out their FBLA chapter. We want to know who wants to go. We don’t have a date yet. You don’t have to compete but it is highly recommended. Competitive event forms are DUE November 30th and you must have paid you dues by November 18th to compete. This meeting will be to work on BAAs and competitive events. Both Gretchen and Carissa have finished their Future and Business levels and will be able to answer questions. We will also be working on competitive events so if you have any questions we will be able to answer them. There will be practice tests and videos to help you in your event. Our Next Meeting is on December 7th. During this meeting we discussed competitive events, future social events, Monday Night Meetings, and community service projects. We also took our club picture for the yearbook at the end of the meeting. Trick or Can: On Halloween, FBLA had a group of members go out and collect non-perishable items for Central's food pantry as a part of Trick or Can. Everyone that came agreed that it was super fun, laid-back, and an easy way to serve your community. I would highly recommend volunteering for it next year assuming that they continue it! Wounded Warriors 5k: Alana has proposed the idea of hosting a 5k for the Wounded Warriors Project, an organization that helps our veterans. We don't have much information about this potential 5k so far, so we will update you as detail progress. Escape Rooms: We discussed the idea of having members participate in a social event at the La Crosse Escape Room. This social event will most likely take place on a Sunday afternoon, to avoid scheduling conflicts with religious activities, sports, or school commitments. There are three rooms: Serial Killer, Bank Heist, and Game Day. They cost between $15-20 and hold various amounts of people depending on the room. Next meeting, we will have specific dates, a sign-up, and make a decision on which room we will be booking. National Fall Leadership Conference: Everyone attending NFLC will be excused from all classes on Friday, meet at 8:15 in the New Commons. 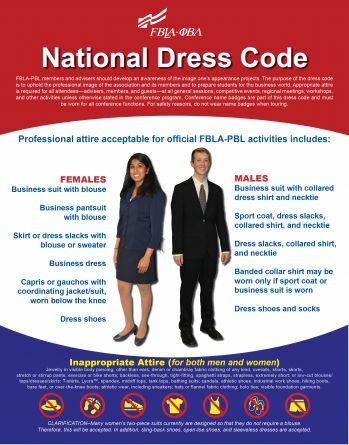 Attached are updated itineraries as well as the FBLA dress code. Monday Night Meeting: On November 14th at 6:30, we are planning on having a open meeting for all members. At this meeting we should talk about/work on the Business Achievement Awards (logins/passwords from Mrs. Colburn) and have a more in-depth look at the variety of competitive events. Competitive Events: We handed out sheets that listed all of the competitive events. For more information, look at the Competitive Events page on this website, or follow this link to the official FBLA website for descriptions, examples, and videos. Events will be chosen based on seniority. For example, if a senior wanted to do an event they would have first-pick over a freshman. This is simply because an underclassman has more chances to compete in that event than the senior. If two people in the same grade want the same event, it is chosen by who turns in their sheet first. If you have further questions, contact Mrs. Colburn or an officer. All member fees must be paid by November 11th in order to compete, and events must be chosen by November 30th. Yearbook Picture: At the end of the meeting we took our club picture for the yearbook. Thank you for everyone who could make it! During this meeting we discussed Trick or Can, the National Fall Leadership Conference, chapter and social events. Trick or Can: Our team will go out on Halloween Day and asked for food donations from those in the community. If you are interested contact Carissa Goddeau. National Fall Leadership Conference: If you are planning to attend please come to a meeting on Friday October 21, Room 115, at 7:40am where we will be discussing details about the Conference. - Escape Chamber: We are considering going to an escape chamber during one of our social activities as a chapter. This will entail having to work together to solve problems to escape the chamber. - Middle School FBLA: We will be visiting the middle school FBLA chapters to help further their education of FBLA and help them with their MAP awards. November 14th: Monday night meeting at 6pm to work on BAA awards. Pay your $20 dues to make your membership official and to receive a Central FBLA t-shirt. During this meeting we talked briefly about upcoming volunteer opportunities, the National Fall Leadership Conference, the Valleyscare trip, and the Business Achievement Awards. We also voted for our two open officer positions, VP of Communications and VP of Events. Trick or Can: Last year, Central held an event called Trick or Can. Many clubs/teams throughout the school went out on Halloween Day and asked for food donations from those in the community. We gained hundreds of food items for our food pantry, therefore we plan on continuing this event this year! FBLA has been asked if we are interested in creating a team for trick-or-can, and helping Central's food pantry. There was interest among the members, so we will have a sign-up sheet at the next meeting for those who want to participate. Football Concessions: October 7th is our last assigned night for football concession. We are sharing this game with DECA. We listed the members that signed up, therefore they will be held accountable if they do not attend. Concessions help our club lower fees for it's members, so if you signed up, show up! Twin Cities Experience: FBLA and DECA are going to the twin cities for a fun fall trip. We will be riding a coach bus there, going to the mall for a few hours, and then heading to Valleyfair for the rest of the night. At Valleyfair there are many rides, haunted houses, and other fun activities to enjoy. This trip is taking place on October 15th, so please sign up before it is too late! All dues must be paid to go on this trip. The cost of the field trip is $50, for more information contact Lisa Colburn or Nicole Hinkel. National Fall Leadership Conference: FBLA is heading to Milwaukee to participate in the National Fall Leadership Conference. There we will go to different workshops, take tours of the surrounding area, and network with people from around the country. We will be going from November 4th-6th. All dues must be paid to go to this event. The trip itself will cost $20. We handed out permission slips to those who are interested, as well as a temporary itinerary and a list of possible tours we could take. If you wish to get a permission slip, contact Mrs. Colburn. These permission slips will be due on October 14th. A link of the itinerary, description, and list of tours can be found below. The votes were counted by the end of the meeting, and we are happy to announce the Autumn Beyer is our new VP of Communications, and Alana Chesebro is our new VP of Events. Thank you to everyone to applied! Business Achievement Awards: We gave all the members a handout of the Business Achievement Award that they're able to recieve next, which for the most part was the Future Level. We talked about the importance of working on your BAAs, for they allow you to gain recognition and leadership skills on a local, state, and national level without competing. We encourage everyone to start working on them! We plan to hold Monday night meetings to help members work on them. The first one planned is on November 14th. The Future and Business Level handouts can be found below as PDF links. During this meeting we discussed upcoming volunteer opportunities, the Valleyscare trip, officer applications, t-shirt designs, and the National Fall Leadership Conference. We also introduced the topic of Business Achievement Awards. Football Concessions: FBLA needs help with concessions during Varsity football games on September 23rd and October 7th from 6:30-9pm as well as during half-time. These concessions help reduce the cost of going to conferences and other activities we go to. If you want to help out, contact Lisa Colburn at lcolburn@lacrossesd.org or visit her in room 115. Twin Cities Experience: FBLA and DECA are going to the twin cities for a fun fall trip. We will ride a coach bus there, go to the mall for a few hours, and then head to Valleyfair Amusement park for the night. This trip is taking place on October 15th. All dues must be paid to go on this trip. For more information contact Lisa Colburn. Officer Applications: Officers applications need to be returned by Friday, Semptember 9th to be considers as an officer for the 2016/2017 school year. To recieve an application or return a completed one see Mrs. Colburn. We will vote for the new officers during our next meeting, October 5th.